At the beginning of May I set off to Botswana with Timbuktu Travel, and I could barely contain my excitement at the prospect of exploring this epic Southern African wilderness. I am a stickler for anywhere that takes me where the wild things roam and nature sets the tone. I landed in Maun on the 6th May, and spent three days exploring various private concessions of the Southern Okavango Delta. I was sceptical at first; the cost for staying in even the most basic tented camp in these parts is far beyond what I could ever afford. But within hours I understood that the beauty of this pristine wilderness was, in fact, priceless. In the private concessions there were no vehicles in site, except those of our own camp. And the guides possessed a contagious passion for Africa. I was entranced. One night, as the sun dipped below the horizon we found a small pride of lions on the hunt. Our presence was of no bother to them so we stayed with them as they walked along the road, until we came across a few impala in the bushes. With rehearsed stealth they broke up into teams of two and surrounded the unknowing impala. We switched off the engine, turned down the lights and listened with soaring hearts at the chaotic eruption that followed. Half of the pride were sub-adults, still learning the tricks of the hunt, so they didn’t have much success this time. And when we flicked the headlights back on I swear I saw the mother lioness roll her eyes in frustration! The South was thick with elephants, lions, leopard and even rhino - a small population is slowly growing here. And I was sad to leave to fly North, but quite entranced by the winding waterways and grumbling hippos of the Linyati. I turned 30 up here, and felt an unexpected rush of emotion to be in the bush listening to sounds of my childhood in Zimbabwe. The chalet I was staying in had a ceiling fan, and the quiet clicking noise it made brought me right back to when I was ten years old and living on a remote island in Zimbabwe. The nostalgia was so thick that in my half sleep I hung my hand over the side of the side of the bed looking for Laddie, my childhood pet. From Linyati I flew with my motley crew to the Chobe National Park. Now, officially thirty it felt only right to see it in with a cruise on the flooded Chobe river and to drink as much Gin & Tonic as I could lay my hands on. After all G&T is a sundowner staple! Our trip finished in Victoria Falls, and we cruised the Zambezi river feeling melancholy; refusing to accept that our trip had come to an end. The waters of the mighty Victoria Falls plunged into an enormous invisible canyon with the impressive force that is named for; Mosi-Oa-Tunya. The smoke that tenders. Indeed! 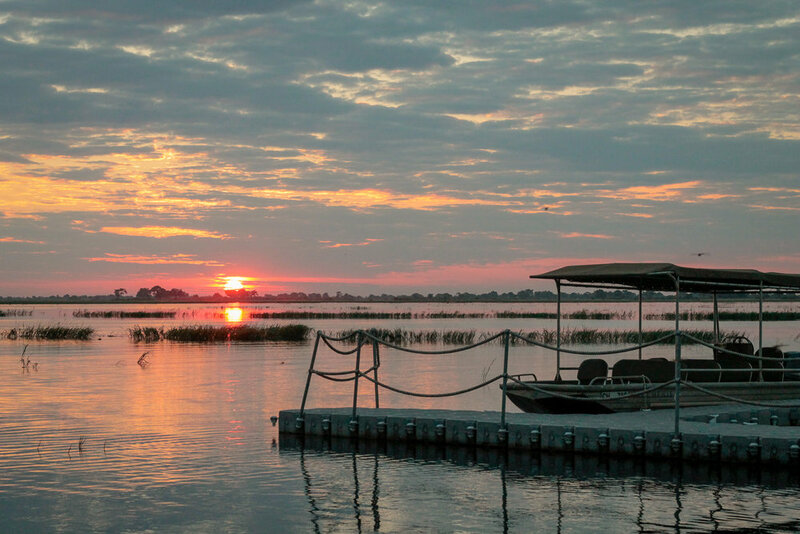 Botswana’s story is one of success, and a love of land and wildlife. I feel honoured to have been a witness to this. I left feeling more empowered than ever to do what I can to support, and maybe one day help to grow these epic wild places. SUPPORT: You can support conservation efforts across Africa by coming along to my Yogis For Wildlife fundraiser, which will be held at Benk + Bo in London. SAFARI: Yoga on safari? What a concept! Get in touch with your dream yoga-safari idea and let's make it happen.